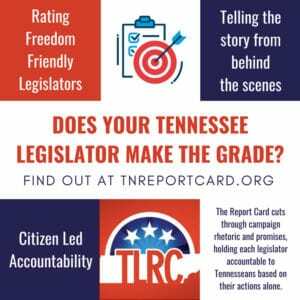 Like most political action committees (PAC), the Tennessee Highway Contractors PAC contributes money to state legislators’ campaign accounts. But would it surprise you to know that those contributions to State House members peaked in 2017, when the gas-tax and registration-fee increasing IMPROVE Act was voted on and passed by the Tennessee General Assembly? The image above depicts the distribution of campaign contributions to State House members over a period of more than five years, starting in 2013 through the pre-primary report filed in July 2018. Nearly half the PAC’s total contributions to House members were made in 2017, the year the IMPROVE Act was passed. 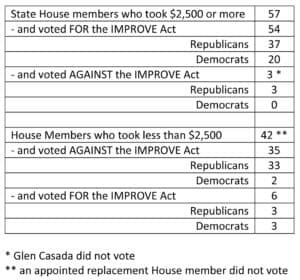 The table below depicts how House members voted for the IMPROVE Act relative to how much money they received from the Tennessee Highway Contractors PAC and the member’s political party. Note that the PAC played no favorites when it came to political party, generously spreading contributions on both sides of the aisle. As can be plainly seen, when contributions from the PAC were in excess of $2,500, only two House members found the wherewithal to vote against the IMPROVE Act, David Hawk and the late Ron Lollar. Glen Casada was not on the House Floor at the time of the vote. 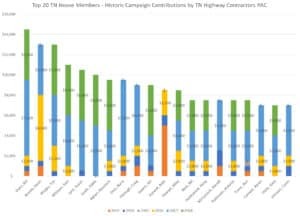 The top 25 recipients of Tennessee Highway Contractors PAC cash can be seen below along with what year they received the bulk of the contribution. All of the top 25 recipients voted for the IMPROVE Act. The contributions from the Tennessee Highway Contractors PAC is just the tip of the iceberg, in that there were many other IMPROVE Act interested parties and PACs that made contributions to House and Senate members. For those who attended the various House Committee meetings and Floor Sessions and witnessed the repeated standing room only situations, this is what all those “suits” in the room yielded.